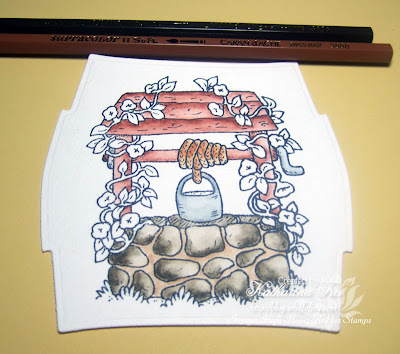 Ila is the hostess of this weeks High Hopes Rubber Stamps challenge with the theme "Use lace on your cards". 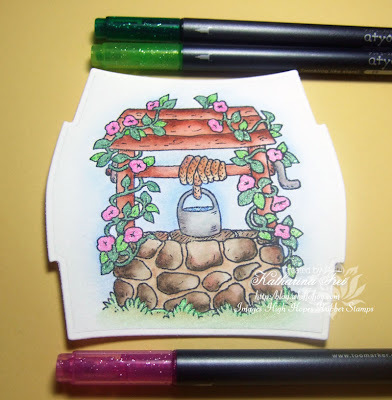 I took some step by step photos of how I coloured the "Wishing Well" from High Hopes with my favourite technique Supracolors (water soluble) and Twinkling H2Os. Ila ist diese Woche die Gastgeberin der High Hopes Rubber Stamps challenge mit dem Thema "Spitze" auf den Karte zu verwenden. Ich habe ein paar "Schritt für Schritt" Fotos davon gemacht wie ich das Hauptmotiv von High Hopes, den Wunschbrunnen, mit meiner Lieblingstechnik, Supracolor Aquarellstifte und Twinkling H2Os coloriert habe. I didn't use any design paper on this card (which is alway a challenge for me...haha). 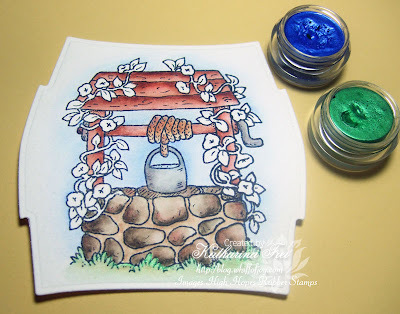 The base of the card is "Wild Wasabi" cardstock from Stampn' Up (retired), which I scored with my ScorPal. I embossed the chocolate chip cardstock with Cuttelbugs stylized flowers folder and sewed the lace to it. I punched the two holes on the main motive with Stampin' Up's slit punch. Ich habe keinerlei Motivpapier auf dieser Karte verwendet, was für mich immer eine Herausforderung ist...haha. Die Basis der karte ist Stampin' Ups "Wild Wasabi" cardstock, den ich mit meinem ScorPal gescort habe. Den braunen "chocolate chip" cardstock habe ich mit Cuttelbugs stylized flowers folder embossed und die Spitze darangenäht (mit der Maschine). Die zwei Schlitze für das Band habe ich mit dem "slit punch" von Stampin' up gemacht. 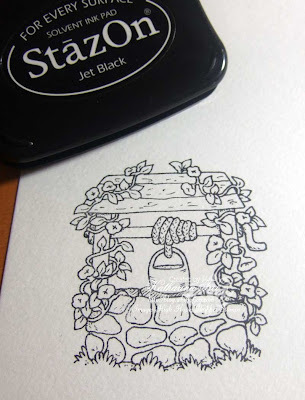 I stamped the image on 300 g watercolour paper from Canson with StazOn jet black ink and cut and embossed it with Spellbinders Label 2 die. I let the image dry for about 4 minutes before continuing. Ich habe das Motiv mit schwarzer StazOn Tinte auf 300 g schweres Aquarellpapier von Canson gestempelt und es mir dem Spellbinders Label 2 die ausgestanzt. Ich habe es ca. 4 Minuten trocknen lassen, bevor ich weiter gemacht habe. I started with the wooden parts of the well and used brown #059. I put a lot of colour on the upper parts of the wooden beams and blend the colour to the lower parts with my watertank brush. If I get too much colour on my pen or if it is too wet, I simply wipe it on a tissue paper and go on. I used brown ochre #037 on the rope and grey #005 on the bucket. Ich habe mit dem Holz des Brunnens angefangen und Braun #059 verwendet. Ich habe sehr viel Farbe an den Rändern aufgetragen und mit meinem Wassertankpinsel in die anderen Bereich hineingezogen. Wenn ich zuviel Farbe auf meinem Pinsel habe oder er zu nass ist, wische ich ihn einfach an einem Taschentuch ab. Für den Eimer habe ich grau #005 verwendet. 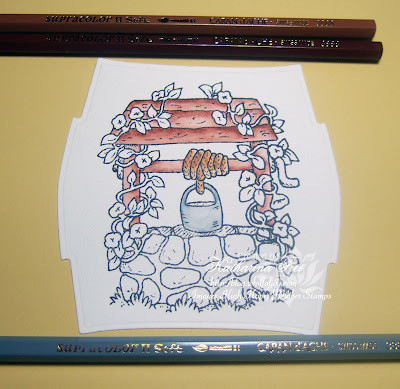 I continued on the stones with umer #049 and tried to set a lot of shades while blending. You can reach this effect if you wipe your brush on the tissue paper right after dissolving the colour and continue with very little colour on your brush. I used brown ocre#037 for the parts between the stones. Weitergemacht habe ich mit den Steinen und habe ein sehr dunkles Braun (Umber #049) dafür verwendet. Ich habe versucht mit dem Pinsel sehr starke Schattierungen zu erzielen. Das geht ganz einfach indem ihr den Pinsel direkt nachdem ihr die Farbe aufgelöst habt, an dem taschentuch abwischt und nur mehr mit sehr wenig Farbe weitermalt. Für die Bereiche zwischen den Steinen habe ich brown ocre #037 verwendet. I put my Supracolors aside to continue with Twinkling H2Os. They are very rich on colour and sparkles and I love to intense my colourations with them. They come in this tiny pots and are very hard, so I like to put a drop of water into the pots before using them to dissolve the colour. I also use my watertank brush with them. 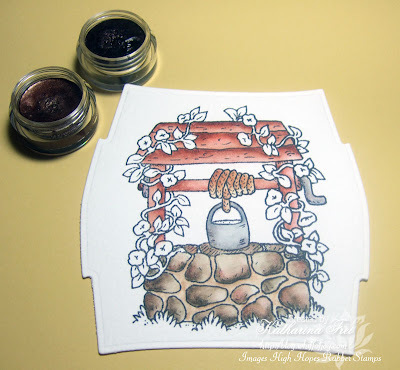 I used Cinnamon Brown and Burnt Umber to set accents on my well. Cinnamon Brown is my favourite Twinkling, it has a light red colour, which gives a vintage and aged look. Jetzt kommen meine Twinkling H2Os an die Reihe. Sie sind von einer sehr intensiven Farbe und glitzern wunderbar. Ich liebe es meine Colorationen damit zu intensivieren. Sie sind in kleinen Tiegeln und sind steinhart. Deswegen gebe ich immer einen Tropfen Wasser hinein bevor ich anfange, um die Farbe zu lösen. Auch hier verwende ich meinen Wassertankpinsel. Ich habe Cinnaon Brown und Burnt Umber verwendet um Schattierungen und Akzente auf meinem Brunnen zu setzen. Cinnamon Brown ist meine Lieblingsfarbe, sie hat einen leicht rötlichen Schimmer, und gibt dadurch allem einen leicht gealternten Effekt. I did the background with Ocean Wave blue and started with a lot of colour around the bucket. Try to wet the area around the image with your brush before applying the colour. This helps the colour to dissolve and gives this smooth effects. The same with the grass. i used Moss Green and applied a lot of colour to the upper part, then blended it towards the lower, already wet, part of the image. Ich habe den Hintergrund mit Ocean Wave Blau gemacht und habe sehr viel Farbe rund um den Eimer aufgetragen. Stellt sicher, dass das Papier rund um den Eimer schon nass ist bevor ihr anfangt. Dadurch bekommt ihr diese fliessenden Übergänge, da die Farbe schöner verschwimmt. Das Selbe gilt für das Gras. Ich habe mit Moss Green sehr viel Farbe auf dem oberen Teil aufgetragen und dann mit dem Pinsel in die unteren, schon nassen, Partien verteilt. I used my Spica glitter pens for the twine. I love to use them on small parts, they have an intense glittery effect and they set themselves apart against the softness of the Supracolor colours. I used Melon #06, Olive #07 and Pink #02. Ich habe Spica Glitzerstifte für die Ranke verwendet. Ich liebe es diese Stifte auf kleinen Bereichen eines Motivs einzusetzen. Sie sind sehr farbintensiv und heben sich von der eher weichen Farbe der Aquarellstifte ab. Ich habe Melon #06, Olive #07 und Pink #02 verwendet. Here is the finished card again. The sentiment is also from High Hopes Rubber Stamps. Hier ist nochmal die fertige Karte. Der Text ist auch von High Hopes Rubber Stamps. Paper: SU cardstock "Wild Wasabi and Chocolate Chip"
Hi Katharina Thank you so much for this tutorial it's fantastic and I will be printing it out to help me with my stamping. I hope mine turns out as good as yours it's beautiful. Gorgeous vard! and so fun to see how you colour your stamps! Thank you! Fantastic tutorial thanks for sharing Katharina. As always a fantastic card. Thank you so much Katharina for an awesome tutorial!! Gorgeous card, love the twinkling h2os and the Spica pens!! Absolutely gorgeous!! Thanks for the step by step! I am always looking for ways to improve my coloring. Katharina deine Karte ist zauberhaft geworden. Ich habe heute nach langem meine Aquarellstifte rausgeholt und damit koloriert. Und danke für die sehr hilfreiche Anleitung. Dein Seifendöschen schaut absolut wundervoll aus. Ich hab von SU solche Hutnadeln und die Kristalle jetzt weiss ich was ich damit anstellen kann. Thank u for the tips! I enjoyed watching you how you made your lovely creation step by step! Beautiful card, I love the image. Thank you for the great tutorial. Kirsten x. Just fantastic, wow! What a work of art! I still say that middle brown layer is CHOCOLATE!!! ha ha What a pretty card and a great tutorial too! Fantastic! Thanks for taking your time w/a tutorial! Thanks for sharing that tutorial, Have wondered about the H2Os how they work. Did you use your watertank brush with them also? Yes, I also use my watertank brush with the Twinkling H2Os. hallo katharina,wauw,da muss ich noch viel üben.wo hast du die h2o stifte her,oder sind das die kleinen kübele die im bild stehn. oh katharina die ist ja wieder sehr schoen und danke fuer die schrit fuer schrit anleitung! sag mal bitte wo bekommst du denn deine ganze spitze her, haste da einen geheimtipp!? Love that you used all cardstock! Like the look of the scored background and great tutorial. I can use all the help I can get with my coloring. Wonderful card Katharina, the image is beautiful and I love your beautiful colouring. 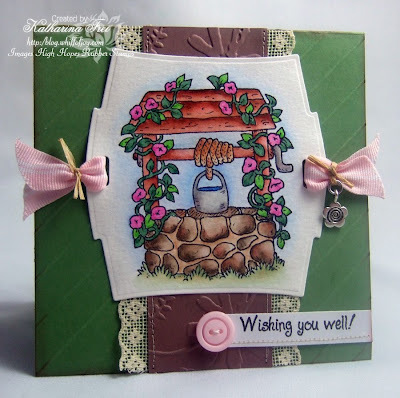 beautiful card and fabulous tutorial, very interesting, thanks for sharing! I LOVED your tutorial, and the card looks Gorgeous! Such cheerful colors, they really stand out! Beautiful image and a fabulously clear and concise tutorial.